The board of beleaguered carrier Caribbean Airlines, the national airline of Trinidad and Tobago, has reportedly undertaken an evaluation of the airline’s routes as its long-haul operation to London continues to underperform. The analysis occurs just as JetBlue launches new service in some of Caribbean’s key North American markets and pilot upheaval is added to the list of the airline’s woes, which also includes financial weakness. Unfortunately, all of those factors culminate in the status quo for Caribbean – increasingly dashed hopes that the carrier could create a new era in commercial aviation in the region. Instead, instability remains the norm at the carrier as it struggles to define its goals and objectives, and more importantly, create a sustainable path to profitability. News of the route review by Trinidad and Tobago-based Caribbean’s board recently surfaced in the Stabroek News, a publication based in Guyana. Caribbean is the largest carrier serving Guyana’s Georgetown Cheddi Jagan International airport, holding a 83% share of the seats deployed. Many of Caribbean’s flights stop in Georgetown including service from Port of Spain to New York JFK, Port of Spain to Toronto and Georgetown-Bridgetown-Port of Spain services. Caribbean’s sole long-haul destination from Port of Spain to London Gatwick is likely on shaky ground as the publication highlighted a quote from Trinidad and Tobago’s finance minister Larry Howai concluding the “London route has not been a profitable route”. The airline launched long-haul service to Gatwick in 2012 after Virgin Atlantic opted to end flights from Kingston to Gatwick. The track record by airlines based in the Caribbean on long-haul service to London is pretty bleak. Air Jamaica, which was purchased by Caribbean in 2010, lost roughly USD27 million on service from Kingston to London in 2006 and eventually dropped the route. Caribbean’s predecessor BWIA also attempted to achieve success in the long-haul market before selling its London Heathrow slots to British Airways in 2007. Caribbean presently operates three weekly roundtrip flights from Port of Spain to Gatwick using Boeing 767 widebodies. Originally, seven weekly flights were planned. 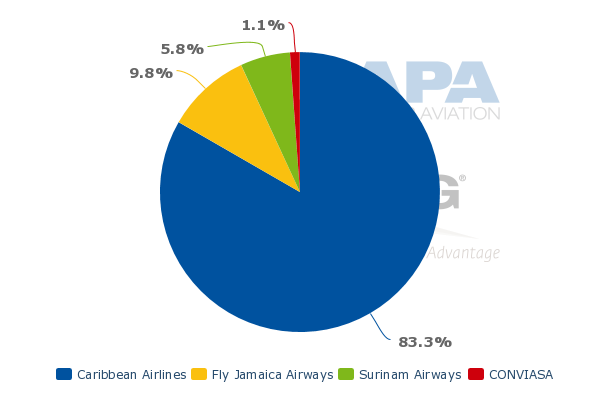 CAPA’s fleet database shows that Caribbean has two of the widebody jets in its fleet otherwise comprised of Boeing 737s and ATR 72 turboprops, making the small sub-fleet somewhat costly to manage given its lack of scale. While Caribbean might have some traction in point-of-sale in the Port-of-Spain market, making inroads in the London market was always challenging given Virgin Atlantic serves Bridgetown in Barbados from Gatwick and Montego Bay and Gatwick, a route also served by Thomson Airways. British Airways operates service from Gatwick to Kingston. 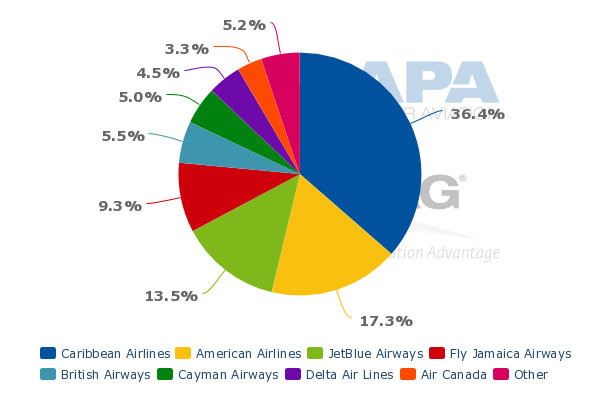 At one point BWIA codeshared with British Airways on service from London to the Caribbean, and it may be time for reconsideration of that potential. Caribbean is the largest carrier in Kingston, so a codeshare with British Airways could certainly prove more viable than a mere three weekly long-haul flights that are losing money. If Caribbean’s board (which has been a revolving door during the last couple of years) is giving serious analysis to route performance, then cutting service to Gatwick and shedding the aircraft used for those flights should become a key priority in the changes necessary to improve Caribbean’s fortunes. Caribbean is also facing intensifying competition on some its key North American routes as JetBlue launches flights from Port of Spain to its strongholds of JFK and Fort Lauderdale. Prior to JetBlue’s launch, Caribbean held a monopoly on service from Port of Spain to JFK. It does appear that JetBlue’s entry has rationalised pricing in the market. The 30-day moving average fare on the pairing was about USD913 on 20-Apr-2013, but dropped to USD668 for 20-Apr-2014 (fare estimated are for economy class tickets). JetBlue’s debut from Port of Spain to Fort Lauderdale is set for 1-May-2014. The route is another market where Caribbean’s monopoly will be broken by a carrier with a well-known presence and perhaps a better product offering than Caribbean - at presumably a lower price. JetBlue’s 34in seat pitch is roomier than Caribbean’s 31in pitch in economy class, so the extra space at a lower fare will no doubt be attractive to travellers curious about a new alternative from Port of Spain, further pressuring Caribbean as it continues to struggle. Caribbean’s major owner is the government of Trinidad and Tobago, and the Jamaican government has a minority stake in the carrier. In 2013 a new board was installed at the carrier with minister from Trinidad and Tobago’s government at the helm. The search is reportedly continuing for a CEO. It is not an enviable position as any chief executive would have to delicately balance the whims of the government against viable commercial business options. The acquisition of Air Jamaica by Caribbean can hardly be deemed a success. The most recent example of the failed execution was protest by pilots from both carriers over not receiving incentive payments owed to them. Against that backdrop reports have surfaced that the government of the Bahamas is in talks with Trinidad and Tobago about a possible tie-up between Bahamasair and Caribbean. Given the track record of Caribbean’s attempt to establish itself as the flag carrier of its namesake region through the purchase of Air Jamaica, any other efforts to merge would be ill-advised until the carrier proves it has achieved a complete turnaround. Adding further political and commercial complexity would scarcely appear a good way out of Caribbean's current problems. Caribbean Airlines is facing pressure on all fronts – financial, network and labour. Roughly four years after the acquisition of Air Jamaica, the scale created by the two carriers that should have ushered some stability into the region has failed to materialise as previous management teams at Caribbean made illogical decisions about the carrier’s network – the service to London Gatwick is the most glaring example. While not likely to occur, perhaps an outright sale by the governments controlling Caribbean Airlines would be most beneficial for the carrier. In the hands of a different management not beholden to the government the tough but necessary decisions to place Caribbean on a path to stability would take place without the influence of a government that perhaps still has aspirations of saying its country is home to the region’s flag carrier. Those dreams have faded, and for the sake of Caribbean’s livelihood need to be set aside. Instead, Caribbean’s owners need to focus their full attention on the market realities that Caribbean is facing – loss making long-haul flights and new, intense pressure on its core routes to North America. It’s a tall order when Caribbean’s owners also have a government to run.